Your Anecdotes of Dr. Johnson my dear Madam are very different to Mr. Boswells. Yours do honour to the subject, the Writer & harm to no one. Although less accurate in some details than Boswell's, her account show the more human and affectionate side of Johnson's nature. On 10 March 1787 Hester and Gabriel Piozzi returned to England. The breach with Boswell was further widened in March 1788 her two-volume edition of Letters to and from the late Samuel Johnson, LL.D. was published by Cadell. The first edition consisted of 2,000 copies, for which Boswell says that she received £500. In August 1788, Hester and Gabriel traveled to Exmouth, where they composed an Occasional Prologue for the local theatre. After the success of Anecdotes and Letters, Hester began work on a new two-volume book Observations and reflections made in the course of a Journey through France, Italy and Germany. This was published by Cadell and Strahan in June 1789. In April 1794 Hester published her book The British Synonymy, or an Attempt to Regulate the Choice of words in Familiar Conversation to mixed reviews. Denbigh: My Synonymes have been review'd at last--the Critics are all civil for ought I see, & nearly just, except when they say that Johnson left some Fragments of A Work upon Synonymy--of which God knows I never heard till now one Syllable, nor had he and in all the time we lived together, any Conversation upon the Subject. 1801 saw the last of her major literary works, called Retrospection or a Review of the Most Striking and Important Events, Characters, Situations and their Consequences which the last Eighteen Hundred Years have presented to the view of mankind. The book was not a success, and received little attention. 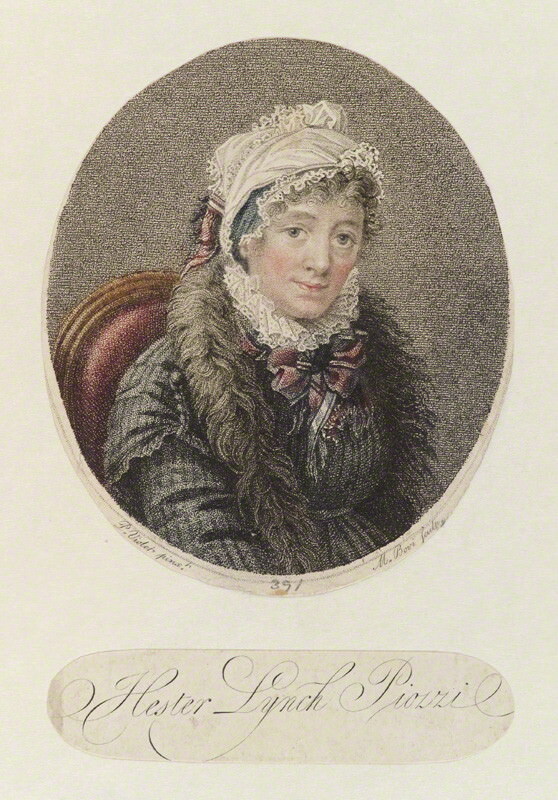 Hester's last - and unpublished - work was Lydford Redivivus or A Granddame's Garrulity prepared in 1815. This was a compilation of 'the names of men and women and their derivations'. As someone interested in Samuel Johnson and 18th century English letters, I was thrilled to discover Thrale.com, which provides invaluable information on these subjects and on the remarkable Hester Thrale, whose Anecdotes and other writings I've read and shared with others. Thrale.com, both in its content and its excellent design, represents the best use the Web can be put to. The amount of time your labor of love will save researchers and devotees is immeasurable. Hester Thrale's spelling, grammar and capitalisation, some of which may not conform to today's standards, are reproduced faithfully throughout. I point out this trivial matter in the interest of appeasing the irascible ghost of Dr. Johnson, should it ever wander onto Thrale.com. I imagine that said ghost must be in an ever-deepening foul mood, since it has had to keep its legendary mouth shut for over 200 years while countless volumes, starting with your famous relative's, appear about its life and works. Again, thank you rendering a real service to the Thrale family and to people interested in learning about it. Thank you very much for your generous and kind words. Whilst I really enjoy creating Thrale.com, I must say that comments like these make it all worthwhile. Thank you. No man but a blockhead ever wrote, except for money. I try to regularly add more information and writings on a regular basis. Do sign up for my free newsletter for occasional updates as they become available. If there are any particular writings or information that you would like to see on Thrale.com, do let me know and I'll see what I can do!